Another week, and another great guest on the Concealed Carry Podcast. 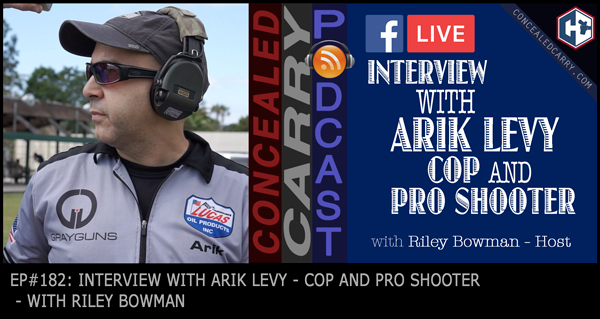 This time Riley interviews Arik Levy, a professional cop and professional shooter. He is also the founder of Firearms Nation and host of the Firearms Nation Podcast, and each December he puts together the Shooter's Summit, a week long, virtual academy featuring the best firearms instructors, trainers and shooters. This year Riley was invited to participate in the 2017 Shooter's Summit, you can see Riley's session on Tuesday December 19th. Go to www.shooterssummit.com/riley to get signed up for FREE ACCESS to this year's Summit! Also enjoy this podcast episode as Riley flips the table around and gets to ask Arik the heavy hitting questions! Press ‘PLAY' to listen now!